SAW019771 SCOTLAND (1948). Selkirk, general view, showing High Street and Elm Park. An oblique aerial photograph taken facing north-east. This image has been produced from a print. 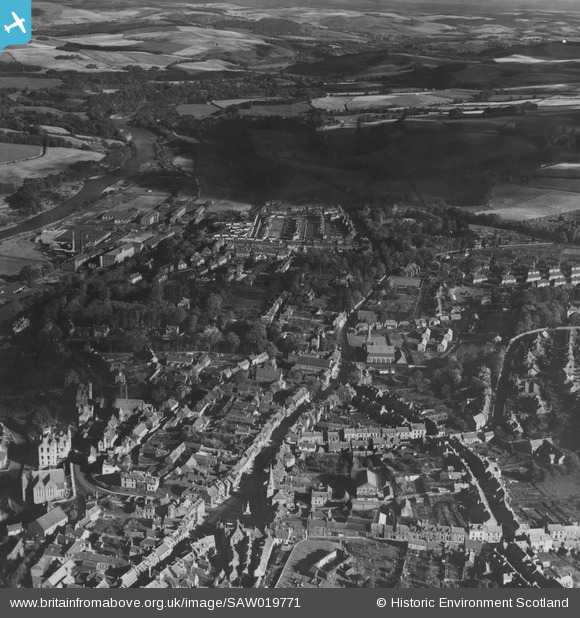 Title [SAW019771] Selkirk, general view, showing High Street and Elm Park. An oblique aerial photograph taken facing north-east. This image has been produced from a print. Halliwell's House museum is here, which tells the story of Selkirk over the years. This narrow, shadowy, cobbled close is typical of how much of Selkirk would have looked during the eighteenth century. There would have been a variety of trades undertaken here. At one time a wig maker lived here, and in later years an ironmonger's shop was set up. going through the pend takes you to Market Place. A cobbled oblong marks the site of the Mercat Cross. The Pant Well was built in 1898, though there had been a well here since 1706. It is decorated with coats of arms and the head of Queen Victoria. The names of the local men who fought in the Boer war are marked on a plaque. The Town Arms is a Victorian pub built in 1876. It is decorated with carvings and the head of Bacchus the god of wine. A plaque here records the site of the house where the Marquis of Montrose spent the night before the battle of Philiphaugh in September 1645. The battle was fought not far from Selkirk, and there is an exhibition at the battlefield. The library used to be Selkirk's prison. You can still see the bars on the windows. Above the door at number 9 is a small plaque of a thistle, the logo of the Caledonian Insurance Company. Before there was a fire brigade people would pay different companies to rescue their houses in the event of a fire. They would only save the property if the owner had paid their insurance. The plaque was a sign to show that the building was insured. In Market Place is the Scott Monument. It stands on the site of the Old Tolbooth, which was the town hall and prison. This would have been the market place for the medieval town. The Town Hall was built in 1803 to replace the Tolbooth. Sir Walter Scott was the Sheriff here for thirty years from 1799-1829. The County Hotel used to be a coaching inn. Many famous people have stayed here including Sir Walter Scott, James Hogg and the Duke of Wellington. Above the door is a statue of a champion greyhound which belonged to an owner in the 19th century. The famous Borders Artist Tom Scott RSA was born here in 1854. He is buried in the Auld Kirk graveyard. There is a bronze bust of his head on the wall. The Victoria Halls were built in 1895 and is the town's community hall. The Buttercup Dairy on the High Street has a beautiful tiled entrance. It used to be an inn called the Swan. There is a carving of a swan on the front of the building. French officers were kept here as prisoners during the Napoleonic war. Outside the Victoria Halls is the Flodden Memorial. It shows A man called Fletcher who was the only survivor out of 80 Selkirk men to return from the Battle of Flodden in 1513. Here is a statue to local explorer Mungo Park who explored West Africa and died in 1805 trying to find the source of the River Niger. This cottage is probably the oldest building in the street. It is made from rough stones and would have had a thatched roof. The Masonic Hall was built in 1887. It is built with different materials to most of the buildings in Selkirk. The materials were brought from elsewhere. The Lady Well is a reminder of where the people in Selkirk would have got their water before plumbing was invented. On Back Row there is a marriage stone from an old house that stood on this spot. It says F M T B 1700. It was made by an apprentice mason when he got married. On a newer house at this crossroads you can see a statue of a souter - the Scots word for a shoemaker. Shoemaking was an important trade in Selkirk in the past. People from Selkirk are called Souters. The bell chain on the gate to the Auld Kirk has this penny from 1914 attached to it. There are many interesting gravestones in the kirkyard. The ancestors of the US president Franklin D. Roosevelt are buried here. Auld Kirk. A church has stood at this spot since 1152AD. William Wallace is said to have been named Guardian of Scotland here in 1298. This is the ruin of a church which was built in 1747. It was the parish church until 1747. Grieve's snack attack. Home of the Selkirk Bannock. 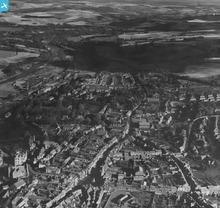 This image of Selkirk was enlarged and placed on the wall in Rowland's. The young people were asked to help identify places shown. Click on "See image record" to see what the young people found out.